The spindles are your "axles" and where you bolt your wheels on. Most commonly your front wheels need spindles 4" long, check your wheel or the supplier's web site for your specific wheel to ensure those spindle sizes work. The bolts you buy for the spindles will probably be zinc plated, or galvanized. Use safety precautions: zinc exposure is bad. Really, really bad. Our plans show that there should be 7 degrees tilt out at the bottom of the spindle, and 7 degrees rear facing of the spindles. It's not critical, but it will allow you to turn faster. Many wheel sizes are available from the suppliers, the most common are 4, 5, and 6" wheels. 5" wheels seem to be the most common. The hubs mount inside the wheel, and accept bearings sized at either 5/8" or 3/4". The bolts you use when making the spindles will need to be either dimension. We prefer using the 5/8 bearing since the bolts are a little thinner. The tires are sized 4.10x3.50x5" (for a 5" wheel). You'll need tires and tubes. Check go kart hubs prices at Northern Tools. Check wheel prices at Northern Tools. You can make your own spindles if you have the tools, or you can order them from parts houses. First weld together your spindle bracket from 1/4" x 1.5" material. We made them 3"h x 2" w. The brackets must be square, and these welds are critical. Weld them to your frame. Then measure your spindle bracket inner size. 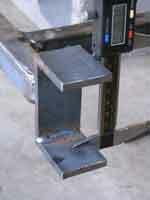 You can make a rough cut and grind and fit, grind and fit, or a pair of calipers will tell you the precise measurement. This set was bought on sale at Harbor Freight for only $15, so don't think that calipers are unaffordable. The more you work with metal, you'll be glad you have them. Use your measurement to cut your length of 3/4" OD thick wall (.120) tubing. This has an ID of .510", so you won't need a bushing for a tight fit. Take your axle bolts and grind down a straight notch. This helps for alignment, and to get a better weld. 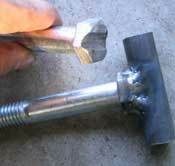 Shown at right is a notched bolt and the welded outcome. Now assemble the tubing/axle into the bracket with a 1/2" x 4" bolt. You could add a grease fitting, or just disassemble periodically and grease them. Finally, weld on the spindle arm at 105 degrees from the axle. Cut the 1/4" material in the chop saw at 15 degrees for an easier alignment. Now you've got a completed spindle assembly. Note that we didn't use the 7 degree pitch on this assembly. Check prices on spindles at Northern Tools. For the rear axle framing member we used thick-wall 1" round tubing. Prep your bolt you'll use by grinding any raised lettering from the head. 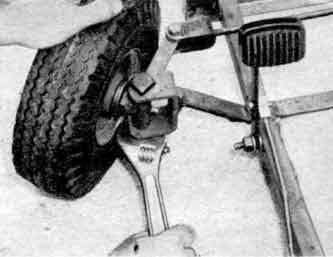 Getting the bolts square is a difficult job, but you'll need to get it right or face exacerbated tire wear. Eyeball the straightness using the framing member as a known straightedge (photo 1). Then get your square and make sure it's straight from multiple angles. Ensure that your square can sit flush and the tack welds don't get in the way. Tack in multiple places before finish welding. You'll use so much heat on these that it's easy to get some movement. Check prices on axles at Northern Tools.